Ex-Obama Adviser Brews A Different Tea Party Van Jones left his post as "green jobs czar" in 2009 amid a firestorm of criticism. Now he's back with the "American Dream Movement," a grass-roots organization looking to mobilize what Jones considers the silent anti-Tea Party majority. Van Jones was President Obama's special adviser for "green" jobs when he was hit with a wave of criticism from conservative pundits about his past associations. The controversy forced him to leave his post in September 2009, but it wasn't the last we'd hear of him. That same conservative wave went on to make a major splash in Congress through the Tea Party. 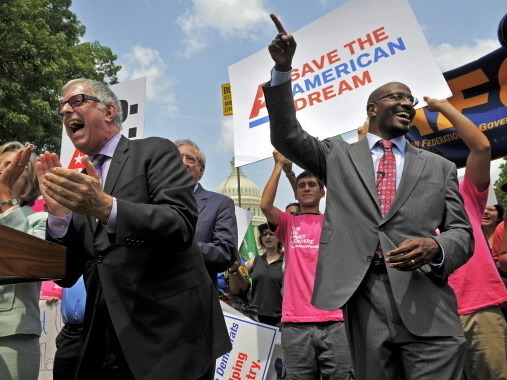 Jones decided to fight back, founding a group called the "American Dream Movement." Some people call Jones' group a liberal version of the Tea Party. His inspiration, he tells weekends on All Things Considered host Guy Raz, is the silent majority of Americans who he believes oppose Tea Party platforms. "Sixty to 70 percent of Americans agree that jobs are more important than this debt-ceiling debacle," Jones says. "Sixty-seven percent of Americans agree that we should raise taxes on the wealthiest in a crisis like this. We aren't being represented." Jones finds it ironic that those who see government as the problem refer to themselves as patriots. "Everything the Tea Party says about America's government is how terrible it is," Jones tells Raz. "You can't take a wrecking ball, paint it red, white and blue, call yourself a patriot, and then smash down every institution that made America great." While anger is usually more effective at mobilizing political movements, Jones says his group has been successful with a more optimistic message. Referring to the first Tea Party gatherings in summer 2009, Jones says, "We had twice as many house meetings to start our movement as they did. They had 800, we had 1,600." Jones says his group now has 127,000 members. The "American Dream Movement" has three major policy planks: Raise taxes on the wealthy to Clinton-era levels; responsibly draw down the wars in Iraq and Afghanistan; and investi in public infrastructure to combat unemployment. Jones says infrastructure projects can be financed in smart and efficient ways. But he's aware of a challenge: "We're not even focused on the smart ways to get Americans working because we're chasing the Tea Party down the street."